Back for part 2 of this review of my first order from TT Combat - a company specialising in laser cut MDF terrain. Again just to remind you that I am in no way affiliated with the company and that this is a totally honest review in my quest to get some decent terrain at a reasonable price. 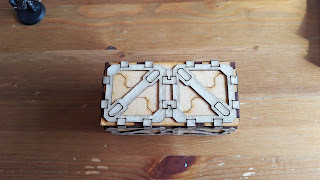 The basic box was built and glued together with PVA glue and was pretty solid I have to say. 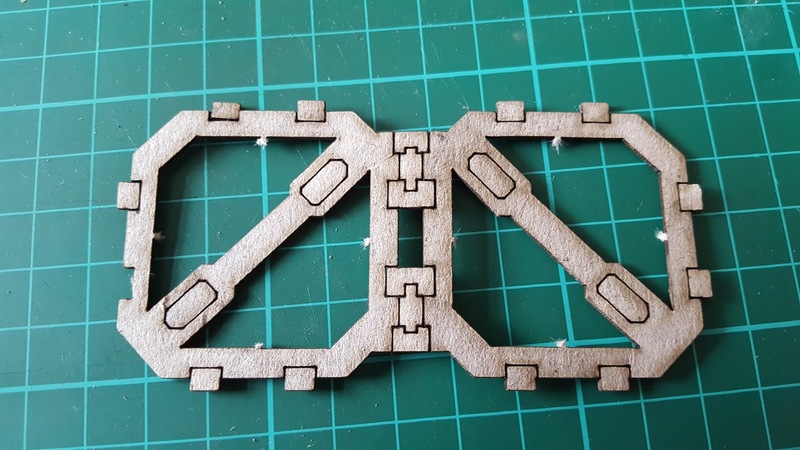 They look pretty good as is but as part of the kit you also get a 1mm grey board which consists of detailing that you can attach to the 3mm MDF. I had covered this in part 1 but hadn't glued it all together. 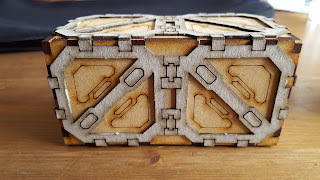 The point of the grey board in this kit is that it turns the simple box into a bit more of a sci-fi container. 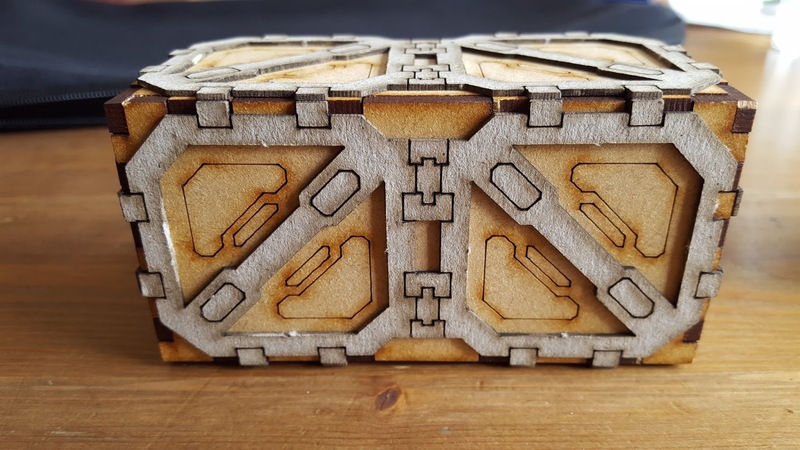 As the board is only 1mm thick the pieces were very easy to pop or cut out of the board leaving only attachment points on the inside. These are easy to cut off with a craft knife though. However, also because the grey board is so thin, even with some care, damage does occur to the pieces - one of the tabs had come off on the picture above. I am generally a bit clumsy but I was being pretty careful because of this potential issue and still ended up with this situation occurring. 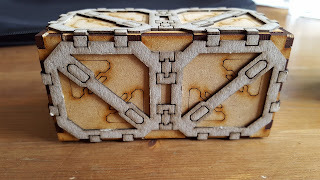 All was not lost however and when PVA glueing the detail onto the crate it all patched back up really well so that you can't tell that the piece was damaged in any way - it actually took me ages to realise which side the damaged piece was on!! The damaged piece on the crate - perfect!! 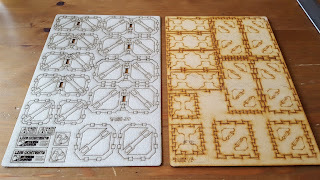 The pieces all fit perfectly on the crates - the sizes matched up beautifully - and with a small amount of PVA they are very solid and look really great. For a sci-fi look I think they are fantastic and that little bit of detailing really sets them off. I think that they look good unpainted, even though I will paint them to fit in with my own boards and they certainly fit the themes of both Warhammer 40k and Necromunda. Without the grey board they would also fit into Age of Sigmar too I think. Embarrassingly after I took the above picture I noticed a mistake I had made. Somehow I only made it once and it isn't significant but is well worth looking out for. 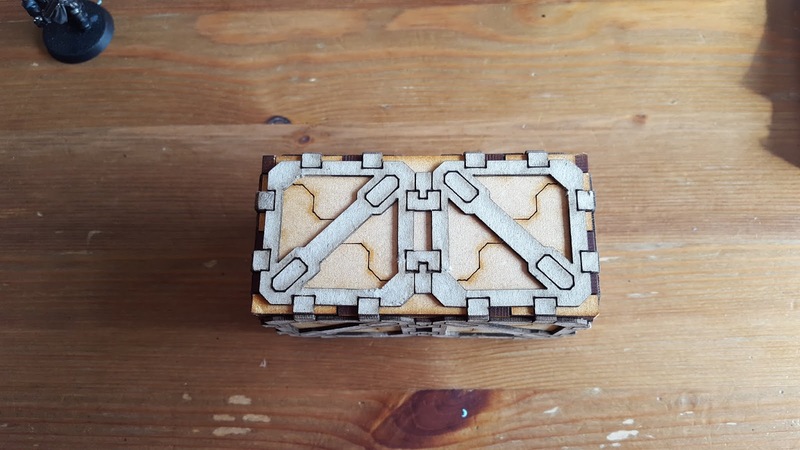 It just means that one of the sides doesn't line up with the lasercut markings on the crate itself. Definitely no big issue but with nothing mentioned in the instructions it's worth mentioning. I just can't believe that I got 7 out of 8 right without trying!!! In conclusion this is a great kit that is really simple to put together and even looks great unpainted. 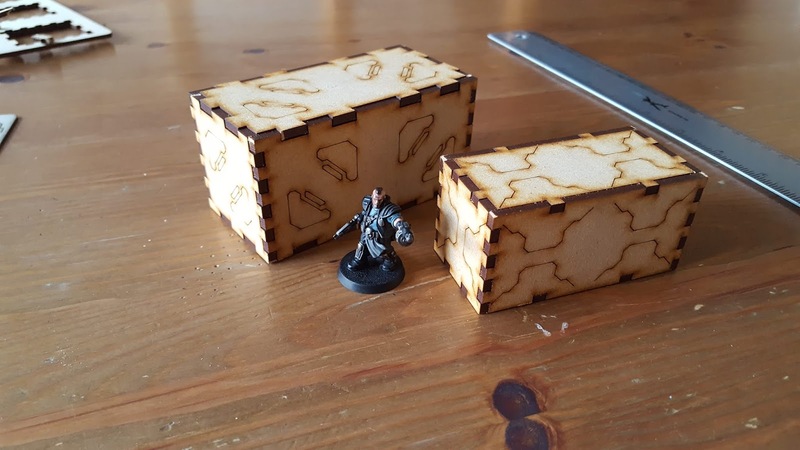 The crates are a good size and perfect for use as line of sight blocking scatter terrain. The value is amazing at only £4.95 per kit and free postage that gets delivered on time. 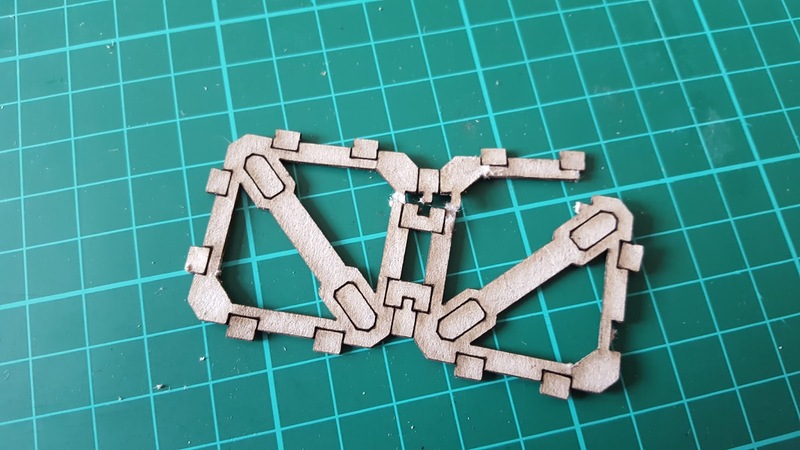 Overall this kit is a 10/10 for me - I can't recommend it enough and I am definitely going to order a couple more sets of these for mine and Steve's Necromunda board plus I have already ordered a set of the barrels as they looked pretty cool too - I'll definitely do a quick review of those when I get them. 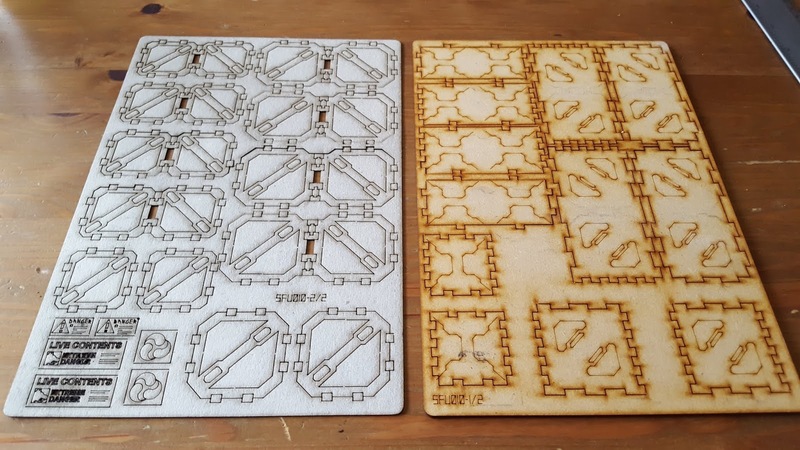 If you have used any of the TTCombat kits or some from any other companies please let us know what you think as I am definitely looking for a few more decent kits to fill up our board. Thanks Ed, it looked like a great battle with some awesome cinematic moments. I've never had any luck with a deathstrike before so it's amazing to see it properly destroy something!! The table looks great, it is really well themed which makes a massive difference. I like the walkways, the tower and the big building in the middle in particular. 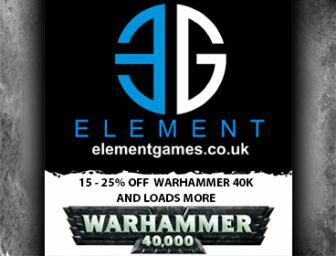 I think they would really suit Necromunda's industrial setting. I'll definitely get some of those. Those look cool! 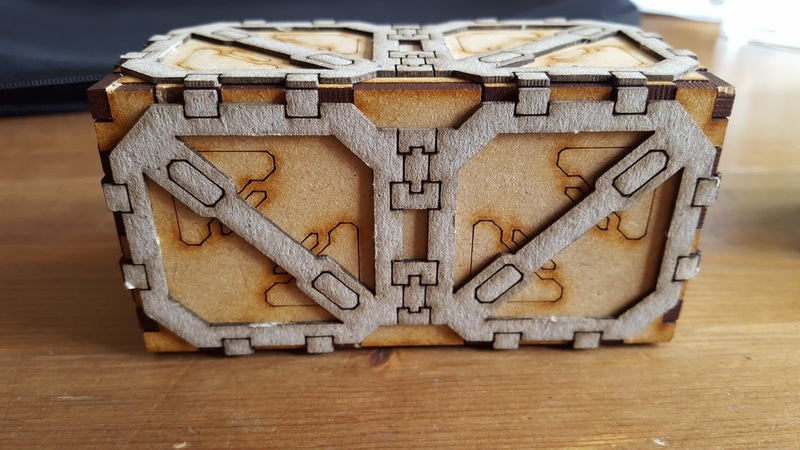 I'm always amazed at how much detail they can get in MDF kits. And on the one that broke: If worse had come to worst, you could have just used the damaged side as the bottom. Same with the one where the detailing is on upside down. And, honestly, if you had done them all upside down, it would still look pretty cool. It would just look like a different type of reinforcement on the containers. I got some stuff from miniaturescenery.com a while ago that I've been really happy with. I've built up their Water Tank, Watchtower, and Hombi GT hover van, and I have the Scuttlebug Transport kit, but haven't got around to building it yet. I found their shipping costs quite reasonable, even coming from Australia. Yes I wasn't concerned about the damage or the wrong way round detailing - it would always be easy to hide one way or another and they look great so all is good. 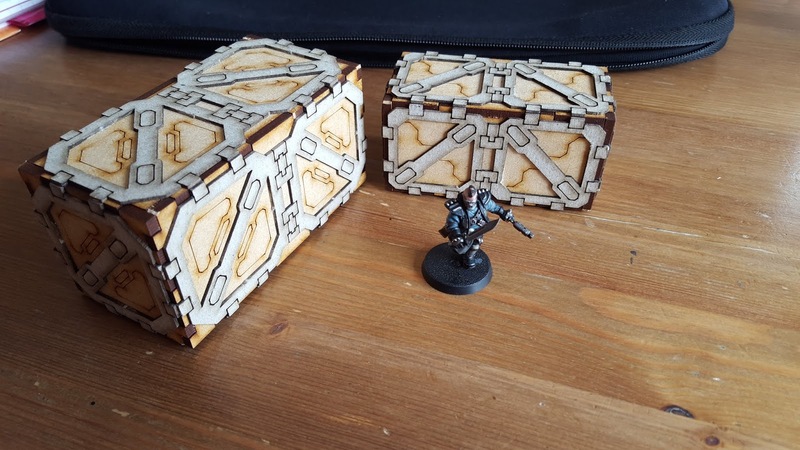 I had a look at miniaturescenery.com and their stuff looks very good. There are some amazing detailing on their products. The twisted city and vehicles look fantastic! The scuttlebutt transport looks cool too, you definitely need to get that built asap! I'd spent the past several months working on Slaanesh stuff and a couple of themed tables for an event last weekend. Now that that's done, I'm getting back into some of the stuff that was left aside for those projects, and my Death Guard is going to be a big part of that.